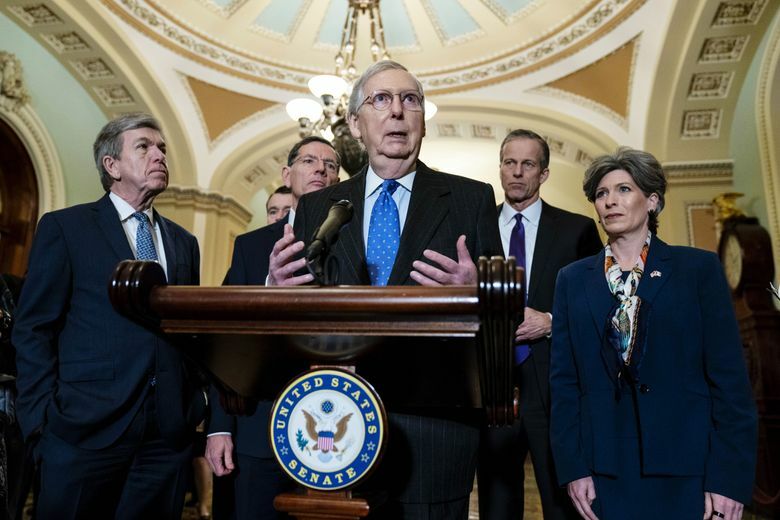 Senate Majority Leader Mitch McConnell, R-Ky., and other Republican senators face reporters at a news conference following a Senate Republican policy lunch on Capitol Hill last week. (Joshua Roberts, Bloomberg). Asked about the pressure from constituents and some of the 800,000 affected federal workers to end the impasse, GOP senators insisted they are facing equal - if not more - insistence to stand behind Trump and his call for $5.7 billion for a U.S.-Mexico border wall. WASHINGTON – One month into a historic government shutdown, Republican senators are standing staunchly behind President Donald Trump’s demand for money to build a border wall, even as the GOP bears the brunt of the blame for a standoff few in the party agitated for, according to interviews this past week with more than 40 Republican senators and aides. Asked about the pressure from constituents and some of the 800,000 affected federal workers to end the impasse, GOP senators insisted they are facing equal – if not more – insistence to stand behind Trump and his call for $5.7 billion for a U.S.-Mexico border wall, especially from conservative voters. This week, Senate Majority Leader Mitch McConnell, R-Ky., plans to move ahead on Trump’s latest offer to Democrats – temporary protections for some immigrants in exchange for billions of dollars in wall money as well as legislation to reopen the government. Nearly all Republicans have indicated they back the plan. “I’m not contemplating anything that the president hasn’t indicated he would sign,” said Sen. Todd Young, R-Ind., the chairman of the party’s campaign arm for 2020. Asked about a compromise bill, Young repeated himself, word for word. Throughout the dozens of interviews with The Washington Post, only six Republican senators were willing to say they would support reopening the government without wall money and without the president’s approval being a precondition. Some Republicans, such as Sens. Cory Gardner of Colorado, Susan Collins of Maine and Lisa Murkowski of Alaska, have made it clear almost since the shutdown began that they would back spending legislation to end the impasse, even without border wall funding. Others, such as Republican Sens. Lamar Alexander of Tennessee, Lindsey Graham of South Carolina and Rob Portman of Ohio, are advocating for a short-term spending measure to reopen the government to buy lawmakers time to consider Trump’s border request – a strategy the White House has dismissed. But those voices are by far the outliers. Scores of Senate Republicans – from swing states to conservative ones, from the highest levels of leadership to rank and file, from Trump acolytes to Trump critics – support the president’s position and have been unyielding, despite pressure from Democrats and the mounting consequences of the shutdown. Numerous Republican senators also said they would support any compromise in wall funding below the $5.7 billion administration request, as long as – again – it had Trump’s seal of approval. “I’m not in favor of a resolution of this impasse that does not include a wall,” said Sen. Mitt Romney, R-Utah. The shutdown has also been a drag on Trump’s personal approval ratings – a decline that comes in a period of tumult at the White House, including numerous vacancies in the Cabinet, an antagonistic House eager to start its investigations into the administration, and uncertainty about the outcome of special counsel Robert Mueller III’s probe into Russian interference in the 2016 election and potential ties to the Trump campaign. An NPR/Marist poll this past week not only showed a decline in Trump’s overall approval rating, but significant drops among core tenets of his political base – including suburban men, white evangelicals and registered Republicans. While many Republican senators – particularly those on the ballot next year in a presidential cycle – sidestepped questions about potential repercussions, others candidly acknowledged they would probably face pain from their base if they chose not to align with Trump. “If the president did not agree to a solution and Republicans tried to force a solution, then there’s a political cost to that,” said Sen. Mike Crapo, R-Idaho. GOP senators are also increasingly peeved at Democratic tactics – such as Pelosi’s suggestion that Trump reschedule the Jan. 29 State of the Union address until the government reopens due to security concerns – and the speaker’s insistence that there will not be any money for a wall in any agreement that resolves the impasse. Senate Republicans are, by and large, resolute in their support for the president, even with the shutdown affecting their home states. Sen. Joni Ernst, R-Iowa, like other agricultural state lawmakers, has been under pressure over the negative impact of the shutdown on farmers, who have been hit hard in Trump’s trade war. The administration extended a key deadline for farmers to apply for bailout funds meant to offset struggles from tariffs. In a 20-minute interview, Murkowski described in detail the pain the partial shutdown was inflicting on Alaska. 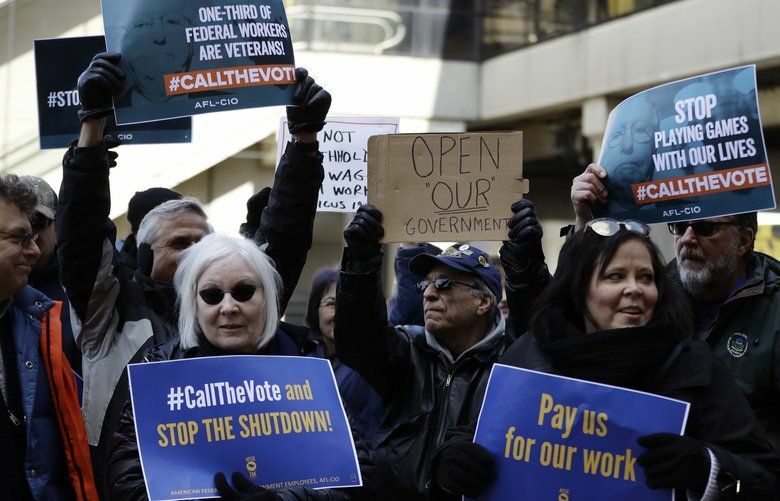 The state, with its federally managed lands, fisheries managed by the National Oceanic and Atmospheric Administration, and the largest Coast Guard base in the nation, at Kodiak, has more federal workers per capita affected by the shutdown than any other. But her home-state colleague, Sen. Dan Sullivan, R-Alaska, stressed that he is firmly behind the president’s wall requests, calling it “eminently reasonable” and emphasizing that Democratic senators had entertained upward of $25 billion in wall money as recently as last February. Border-state Republicans are particularly firm behind Trump, who visited McAllen, Texas, earlier this month as he ramped up his public relations effort for the wall. Sen. John Cornyn, R-Texas, a McConnell confidant up for re-election next year, responded “Uh, no,” when asked whether he would entertain voting for a bill that did not include wall funding. “The president won’t sign it,” pointed out Cornyn.